Welcome to the Tavern of the Taeguk Warriors’ official 2018 FIFA World Cup “Meet The Squad” series. You can refer back to this series to understand the backgrounds, weaknesses and strengths of every player of the 23-man roster. Today, part three – the squad’s seven midfielders. Let us know what you think in the comments below. The captain of this side and a recent inductee into the Korean national team’s century club, Ki Sung-yueng is somewhat of a Korean legend in waiting. Just 19 when he debuted for the senior squad, it’s hard to imagine a national team in the past decade without Ki Sung-yueng involved. As a teenager, he spent some time in Australia, before joining FC Seoul. There, he became part of the “double dragon” duo with Lee Chung-yong and they both eventually left to Europe, with Ki joining Celtic. Two and half years later, he moved to Swansea. He didn’t settle in perfectly, going on loan to Sunderland for minutes, but has since largely taken his place (with some exceptions) making himself known as one of the EPL players with the highest pass completion. Ki has baggage, however – the Chickenwing dance against Suwon, the monkey face after scoring against Japan, and the falling out with Choi Kang-hee on social media. He has matured a long way from those days, but still remains one to speak his mind, albeit in more of a “on behalf of the team” role, notably with the Sebastian Soria scandal. His recent outburst after struggling as a centreback in a 3-5-2 against Bosnia (cursing and throwing his armband at halftime in the tunnel) reveals that he hasn’t complete lost his edginess. In more recent years, Ki has honed his game to become more of a collected deep-lying playmaker, known for his composure, vision and very good passing ability. He can especially split defenses with a deadly effective throughball, or stretch the play with accurate long passes. He controls the tempo of a game. His consistency has made him a staple in this side, and was especially on show in the Asian Cup. It is hard to express how vital he is to the side. A deep-lying playmaker by trade, at a damn good one at that, Ki is the least of Shin Tae-yong’s worries. However, whereas Stielike liked moving him up into more of an attacking mid role in some games, Shin, as mentioned above, seems keen on playing him as a central centreback in defensive systems. Another worry is who will partner him in midfield – an enigma which may honestly go unresolved in his KNT career, and spells a somewhat wasted opportunity for a formidable midfield pair, rather than just one very good central midfielder. The 2014 World Cup captain, Koo Ja-cheol’s career story is another one that is rooted in the K League. His breakthrough in the Jeju United best XI in 2010 as a 20 year-old saw the Islanders go from 14th to 2nd in the league table, and Koo winning a plethora of awards along the way. It became plainly clear that he was too good for the K League, but it took until after the 2011 Asian Cup for him to make his move. At that tournament, he was the tournament’s top scorer (with 5 goals) as a central midfielder, leading to his move to Wolfsburg. In the Bundesliga, he’s had his highs and his lows. At times he’s been a utility player at best, but his highlights include helping Augsburg survive in the 2012/13 season and three consecutive seasons getting more than 22 starts in the past three years. The issue with Koo has always been where to play him. With his club teams, he has played more of a traditional centre midfield role, with good technical skills, physicality and positioning. With the KNT, he played as more of an attacking midfielder or a #10 at the FIFA World Cup, though he was far from the foraging, dynamic attacking playmaker that you would expect. Instead, he was more of a muted, advanced central midfield player who can score goals but won’t necessarily create them for others. Koo is a very good footballer, but one that is lacking an identity. In this national team, he can be expected to go box to box and bring a much needed threat of secondary scoring from a central area. However, his place in the starting XI is far from ensured. Jung Woo-young’s career has been kept away from the spotlight – at mid-to-lower tier Chinese or Japanese teams. He was a very low-key member of the bronze-medal winning 2012 Olympic side, making the squad only after Han Kook-young sustained an injury and playing meaningless substitute minutes against Brazil. He only returned to the national team scene in 2015, called up under Uli Stielike and putting together a series of decent, but inconsistent performances as an able replacement for Ki Sung-yueng. He featured heavily in qualifying. Beside Ki, Jung is very much a quieter, unflashy player. He is tasked with some defensive responsibilities, but even they are not camera-friendly – aerial challenges, a couple interceptions, recycling possession, positioning. However, he unfortunately often seems good for 1-2 badly misplaced passes per game. What seems to have made him an important player is his off-the-pitch skills. Having at times worn the captain’s armband when a player goes off on a substitution, Jung is one of the team’s leaders and liked by the coaching staff. Though he remains quiet, not proving to be much use in attack, and not playing in any assertive or eye-catching defensive role, Jung Woo-young will be taking free kicks alongside Son Heung-min (provided they don’t fight again!). He has had a couple decent looks in pre-match friendlies after that scorching goal against Japan in the East Asian Cup. Jung is disliked by many national team fans, and often with some reason – he doesn’t boast any discernible quality or identity. But, he has become somewhat of a scapegoat. If he starts beside Ki Sung-yueng in the midfield, it will be for defensive cover. The 4th pick in the 2011 K League draft, Joo Se-jong tore up the U-League (university league) at Geonguk University before joining Busan I’Park. It took him until 2014 to break into the senior team, replacing Park Jong-woo in the midfield. Traded to FC Seoul (for a generic Korean forward named Kim Hyun-seung, oops) after Busan was relegated in 2015, Joo emerged as one of the league’s best deep-lying midfielders. He was a key player in Seoul’s 2016 K League win, with some of the most minutes in that championship squad. On the national team scene, Joo has only been called up sporadically, and with varying degrees of success – such is the life of a Korean player who essentially does what Ki Sung-yueng does, in the era of Ki Sung-yueng. Comparing him to be a poor man’s Ki is actually a compliment and quite astute – he’s comfortable sitting in front of the back four, but his biggest strength lies in incisive passing with a lot of composure. In another life, Joo Se-jong could have risen to be the King of Korea’s central midfield. Instead, he likely will only see the bench or substitute minutes. With the exception of maybe Moon Seon-min, both Lee Jae-sung and Lee Seung-woo can play centrally. We’re looking in the context of a 4-4-2 here. If there’s one player who will earn a move to a European club on the back of a good World Cup, this is it. Lee Jae-sung is perhaps quite simply the best player in the K League, and maybe even the best midfielder in Asia. A player of vital importance in the gold medal 2014 Asian Games side, Lee broke onto the national team scene on the basis of exciting performances with Jeonbuk Hyundai in 2015. His origins were more humble, having not featured heavily for youth teams or playing for an affiliated youth club of a K League squad. But today, his popularity has made him into a household name – the kind of player you would nudge your football ignorant relative at a KNT game and go “just watch this guy”. There’s just too much to say about Lee, and not enough time. For those who are not aware, Lee is a creative passer, specializing in tiki-taka-esque one touch plays with precision and sublime positional awareness. He’s unafraid to go at goal and is a great secondary scorer, but it is in his highly mobile, exciting football, including a key throughball or two per game where he has made a name for himself. His dynamism is very welcome in this team and was a breath of fresh air. In fact, you could argue Shin Tae-yong has built this team and the 4-4-2 high press system around he and Kwon Chang-hoon (injured). Lee has been compared by some (you know who you are) as the Korean Rosicky. Defensively, he is energetic, quick and combative – if rash at times. And a lack of physical ability has meant that he sometimes gets drowned out playing as a #10, at least for the national team, instead working best as a wide midfielder – on either side – content to cut in and destabilize defensive lines. Jeonbuk’s dynasty of success at the top of the K League can be attributed to Lee Jae-sung. If Korea is to cause any upsets at this World Cup, it will be attributed to Lee Jae-sung. Look for him to start as a right-midfielder in a 4-4-2, or centrally as a #10 in a 3-5-2. 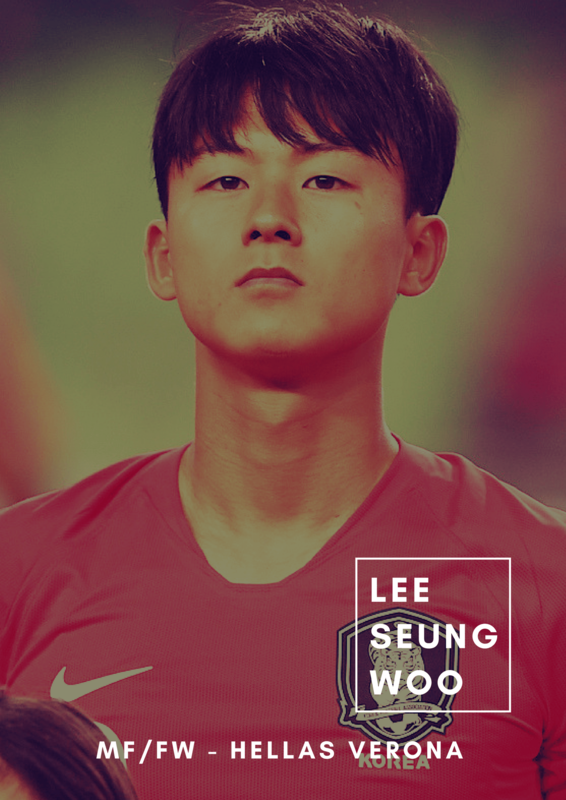 With his unmistakable swagger, charm and cocky charisma, Lee Seung-woo is not your typical Korean player. Having moved to Barcelona’s world-famous La Masia academy as a young teenager, Lee seemed set to explode into the next international phenomenon, shattering Lionel Messi’s youth goalscoring records here and there. The FIFA ban that hit him and two fellow Korean teammates in 2015, however, was a major obstacle in his career. Unable to get consistent playing minutes, and through no fault of his own, the era where the headline “Lee Seung-woo: The Korean Messi” was a plausible thought is now gone. A move to Italy last year after struggling for physicality at Barça B was a good idea, but he has equally struggled to get any playing minutes there. A screamer of a goal against AC Milan near the end of the season, however, drew attention to his qualities. When at his prime, his quick acceleration, unmistakable pace and desire to dribble at players, combined with the excellent skill and tekkers in his locker, make him a unique player. When drifting more centrally – dare I say into a striker’s role – he can drop in between lines and force opponents to keep a keen eye on him. But though his shortness makes him nimble, it also makes him physically useless. And with questionable defensive capabilities, Lee does have a bit of that “luxury player” vibe. He also carries rust from the Verona bench and is unproven on the senior level – club or country. He’s a random bullet. Lee may have turned down his “bad boy” attitude, dropped the dyed hair and is just trying to be one of the men off-the-pitch. But on the pitch, his cockiness, directness and in-your-face snippiness makes him an entertaining player to watch. He’s another level of refreshing – maybe the national team needs a big ego. Moon Seon-min was a very unexpected, and honestly sort of random selection. Not only had he never been called up to the senior team, he wasn’t, unlike Lee Seung-woo, even on the national team pool radar! His story, however, is unlike any other. In 2011, he was one of the 8 winners of Nike’s “The Chance” competition, selected by Arsene Wenger and Giovanni Van Bronckhorst, earning him a ticket to join the Nike Academy. After a year with Nike, he joined third tier Swedish club Ostersunds, helping them get promoted to the second tier, and picking up the club’s Player of the Year award in 2014. However, the lure of home was too strong for an often homesick Moon, and he returned to Korea in 2017 at Incheon United. Moon’s integration in the national team is not complete, and it’s very hard to imagine Shin starting him based on that poor form. However, for lack of other options, Moon may be a substitute option out wide. If you liked this post and want more, consider supporting the Tavern on Patreon! Start Lee JS and Lee SW as the wingers. And I’m still not exactly sure who would be best to pair with Ki. I don’t think Koo is entirely the right fit, though I’m leaning to go with the Augsburg man for his experience and playmaking ability over Jung WY. Park JH could’ve been more of the deeper holding midfielder so Ki could drift forward but looks like Park JH will play LB instead. Also, we’ll definitely be missing Kwon this tournament! Really wish we were able to see his World Cup debut. Finally, it’s unfortunate how Nam Tae Hee’s and Kim Bo Kyung’s careers never really panned out the way we were all hoping. They could’ve been assets in the midfield this World Cup, given the pivotal roles they played at previous big tournaments like the 2015 Asian Cup and 2012 Olympics. Yeah, very disappointed that Nam Tae Hee and Kim Bo Kyung’s career never found more time in Europe. So many high hopes for them both. Still sad about Kwon as well. Why won’t anyone join me on the Joo Se-jong hype train! There’s plenty of room.